The Fire Phone was a 3D-enabled smartphone developed by Amazon.com and manufactured by Foxconn. It was announced on June 18, 2014, and marked Amazon's first foray into the smartphone market, following the success of the Kindle Fire. It was available for pre-order on the day it was announced. In the United States, it launched as an AT&T exclusive on July 25. The phone was notable for its hallmark feature "Dynamic Perspective": using four front-facing cameras and the gyroscope to track the user's movements, the OS adjusts the UI so that it gives the impression of depth and 3D. Other notable Amazon services on the phone include X-Ray, used for identifying and finding information about media; Mayday, the 24-hour customer service tool; and Firefly, a tool that automatically recognizes text, sounds, and objects, then offering a way to buy recognized items through Amazon's online store. The phone had received mixed reviews. 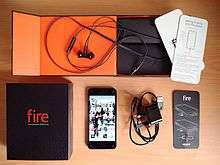 Critics had praised the Dynamic Perspective, Firefly and, to a lesser extent, the packaged headphones, but derided the build, design, Fire OS version of Android, specifications, and exclusivity to AT&T. Amazon had not released sales figures for any of its devices, but based in part on its quickly declining prices and an announced $170 million write-down, analysts have judged that it had not been commercially successful. Amazon stopped selling the phone in August 2015, and has not announced a followup model, leading to speculations that the device has been cancelled. The Fire Phone was rumored to be under development for several years prior to its release. Amazon reportedly started work on the phone in 2010, showing a prototype to AT&T in 2011. The first mention of a possible phone designed by Amazon appeared August 2010 in the New York Times, with a source within Lab 126 claiming that "entering the mobile phone market… seemed out of Amazon's reach. But… Amazon had not definitively rejected the idea of building a phone in the future." Shortly thereafter, some claimed that Amazon might purchase WebOS from Hewlett-Packard, using its software and patents to build a phone. According to current and former employees of the company, the project for the Fire Phone started after Apple announced the iPhone 4 in 2010, and was codenamed "Tyto" for a genus of owl. Jeff Bezos reportedly "...envisioned a list of whiz-bang features... NFC for contactless payments, hands-free interactions to allow users to navigate the interface through mid-air gestures and a force-sensitive grip that could respond in different ways to various degrees of physical pressure", most of which ultimately did not end up in the final product. He also "obsessively monitored the product", requiring that "even the smallest decisions needed to go by him". Frustration built up over what appeared to Lab126 workers to be extraneous features such as Dynamic Perspective, although they continued to work on the project due to the respect they held for Jeff Bezos. Later, in 2012, The Wall Street Journal contended that Amazon was testing a smartphone, with a screen size between four and five inches. Bloomberg also reported that Amazon was looking to acquire patents in order to defend against allegations of infringement concerning the use of wireless technology of the phone. The Verge claimed that "multiple sources" confirmed the existence of the Amazon phone and that it would be announced alongside the updated Kindle Fire and Kindle Paperwhite in September. In 2013, reports claimed that Amazon would partner with HTC to create a "Kindle Phone" that would be free with Amazon Prime membership. Amazon denied these rumors, stating that the company "will not launch a phone this year" and that if it did, it "would not be free". It continued to develop its phone while denying such rumours, and by 2013, it had split into two projects: "Duke" and "Otus". "Duke" was intended to be the higher end device in its portfolio, while Otus would serve as a low-cost or free (to Amazon Prime members) alternative to Duke. Jeff Bezos later reconsidered, believing that only a phone that could set itself apart could compete against established phone manufactures such as Apple, and that a lower-cost, bare-bones phone would hurt the Amazon brand. Although many rumors were not accurate, several final specs, the use of 3D, and the release date were correctly reported. The phone was introduced in Seattle in the Fremont Theatre, at a press event held by Amazon's CEO, Jeff Bezos. As a limited time promotion, buyers were offered a year of Amazon Prime and 1,000 Amazon coins with the purchase of a Fire Phone. Amazon's Fire Phone was priced at $199 for the 32GB version and $299 for the 64GB version on AT&T (with a two-year contract). The pricing range puts it on the same playing field with Android and Apple flagship smartphones. Six weeks after the introduction of the phone to the market, its price with a two-year contract was cut from $199 to $0.99 and the off-contract price went from $650 down to $449. In November 2014 the price for the unlocked version dropped to $199 and even further to $179 in April 2015. After a further price drop to $130 in August 2015, the device eventually was listed as unavailable on the Amazon site. On August 27, 2015, the "Phandroid" website reported that Amazon had discontinued the Fire Phone. The Fire Phone uses a 4.7-inch IPS LCD Gorilla Glass 3 polarized touchscreen display with a 315 ppi. Its front features the screen and a rounded rectangular home button below the display. The back, made of the same Gorilla Glass, houses the camera, LED flash, and secondary microphone. The sides of the phone are made of a soft touch plastic. On the top of the phone there is a lock/power button and a 3.5 mm headphone jack. The left side of the device has 3 buttons made of anodized aluminum: two volume buttons and a camera shortcut button. When the camera button pressed, the camera app opens; when held down, Firefly is opened. The bottom of the phone has the primary microphone, a micro-USB connector port, and dual stereo speakers with Dolby Digital sound processing. The phone uses a Snapdragon 800 chip paired with an Adreno 330 GPU and 2 GB of RAM. Internal storage is non-expandable, with options between 32 GB and 64 GB. The rear camera is a 13 MP CMOS sensor with an f/2.0 five-element wide aperture lens with OIS. The battery is non-removable and has a capacity of 2400 mAh; Amazon claims this provides up to 22 hours of talk time and up to 85 hours of standby time. The reception to the Fire Phone had been mixed. Although reviewers found Firefly and the Dynamic Perspective features to be significant differentiators, they also noticed several drawbacks. Such drawbacks include the 2013-level technical specs (including the lack of Bluetooth LE), the underdeveloped OS, its high price, and the exclusivity of the device to AT&T's network. The hardware also received a mediocre reception: while some liked the design, others were concerned about the durability of the glass as well as the thickness and weight. However, the headphones were well received by at least one reviewer from Gizmodo, who said that "all cheap headphones should at least be this great." Farhad Manjoo of The New York Times compared the phone to "Mr. Pine's purple house" (in which the eponymous character paints his house purple to stand out from others), stating that "Amazon has built a nice, solid, plain white house. You'll love living in it, if you can ignore all the purple.". This references the "superficial features" of the Fire Phone, "born of the same superficial impulse", including Dynamic Perspective. They also criticized the phone's appearance, stating that it "looked more like a prototype than a finished product." Unlike The Verge, The New York Times felt that the interface was "relatively simple to navigate". The Wall Street Journal's Geoffrey Fowler praised Amazon for "attempting to make inroads that might disrupt the giants", remarking that the smartphone market needed new ideas. All the same, the reviewer compared the phone's features to "the grown-up equivalent of a 9-year-old riding a bike with his hands in the air" - gimmicks, without much real-world usage. They also stated that the battery never lasted for an entire day, a "telephonic cardinal sin". ZDNet's Zach Whittaker wrote that the Fire Phone could be described in two ways: a motion sickness inducer, or a gimmicky device at best, but one that has great potential. Unlike other reviewers, he felt that the phone was "beautifully constructed" and "easier to hold". Dynamic Perspective, on the other hand, gave him motion sickness and made the text harder to read. He concluded that the Fire Phone had strong hardware, but that the software let it down. 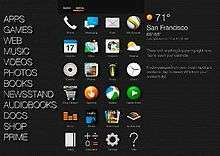 James Kendrick, another of ZDNet's authors, expressed that the "feature in Fire OS that makes devices so nice to use is the large carousel toward the top of the home screen (..) Fire OS is similar to iOS in one regard in that it hides the power of the OS under the hood. What’s exposed is the part of the OS that makes the Amazon device comforting and easy to use. (..) That’s why Fire OS is better than Android for the majority of smartphone and tablet users." The Fire Phone has been labeled as the most-polluting phone by Greenpeace, who claims that Amazon's servers are powered by non-renewable sources of energy. Amazon disputes these claims, claiming that Greenpeace's data is incorrect and misleading. This led to a large quantity of one-star reviews being left on Amazon's website as a form of protest on the part of Greenpeace activists. Technology reviewer and Internet personality Marques Brownlee stated in his Smartphone Awards video that the Fire Phone was the "Bust of the Year", stating that "… It wasn't really a good phone in any way, and there was no real reason for people to buy it (..) It just didn't really have anything going for it." When asked about the perceived flop of the Fire Phone during Business Insider's Ignition conference of 2014, Jeff Bezos defended the product, saying that it was a "bold bet", and that his company had to take such bets in order to stay relevant. He continued by saying that it would "take many iterations" and "some number of years" before getting it right, comparing it to the Kindle line of e-readers. The Fire Phone occupied the number one spot on the "Best Selling" list on Amazon.com, before sales dropped precipitously after two weeks. Amazon shares dipped by 10% 24 July 2014, one day prior to its launch on AT&T, due to increased losses incurred by the development of the Fire Phone. On 25 July 2014, several AT&T stores reported little to no sales, although several stores experienced increased foot traffic and interest for the Fire Phone. Amazon has yet to release official sales figures for the device. According to Chitika Insights, an advertising company, by analyzing ad impressions from 25 July to 14 August 2014 (20 days after the release of the device), the Fire Phone constituted approximately 0.02% of the smartphone market in the United States and Canada. The device's usage share "remained steady but relatively flat". The Guardian later extrapolated based on data from ComScore and Chitika, claiming that there were no more than 35,000 Fire Phones sold in the first 20 days. In September 2014, The New York Times reported that sales had been "dismal", and that "analysts say Amazon has sold only a few tens of thousands" of Fire Phones. In October 2014, during the announcement of third quarter financial results, Amazon stated that they took a $170 million hit due to costs associated with the Fire Phone and had over $83 million worth of Fire Phones in inventory, but declined to comment on how that would affect predictions for the fourth quarter. The company's CFO Tom Szkutak indicated that its pricing strategy being initially too high was the reason for the product's poor consumer reception. ↑ Bruce Einhorn. "Amazon's Fire Phone Boosts Foxconn". Businessweek.com. ↑ Lee, Nicole. "Amazon announces the Fire Phone". Engadget. Aol. Retrieved 18 June 2014. ↑ "Amazon unveils Fire Phone". CBC News. CBC. Retrieved 18 June 2014. ↑ Cunningham, Andrew. "Amazon announces the Fire Phone, $199 with 2-year contract for 32GB". Arstechnica. Condé Nast. Retrieved 18 June 2014. ↑ Molen, Brad. "Live from Amazon's phone announcement in Seattle!". Engadget.com. Retrieved 2014-06-18. 1 2 Eadicicco, Lisa (2014-06-18). "This Is Amazon's First Smartphone: The Fire Phone". Business Insider. Retrieved 2014-06-18. ↑ Moynihan, Tim (2014-06-18). "Everything You Need to Know About Amazon's New Fire Phone". WIRED.com. Condé Nast Inc. Retrieved 2014-06-18. ↑ Lowensohn, Josh. "The Amazon smartphone is here: meet the Fire Phone". The Verge. Retrieved 2014-06-18. ↑ "Amazon Fire Phone Flops". TechCrunch. AOL. 1 2 Cheng, Roger (2014-10-23). "Amazon takes $170M charge on Fire Phone". [CNET]. [CBS Interactive]. Retrieved 2014-10-26. ↑ Duryee, Tricia (8 September 2015). "Amazon finally stops selling the Fire Phone, as company adjusts its hardware strategy". GeekWire. Retrieved 9 September 2015. 1 2 3 Cheng, Roger (2014-06-18). "AT&T: Amazon Fire Phone will get 'classic hero treatment'". C|Net. CBS Interactive Inc. Retrieved 2014-06-20. ↑ Bilton, Nick (2010-08-10). "Amazon Is Said to Look at Hardware Beyond Kindle". The New York Times. The New York Times Company. Retrieved 2014-06-19. ↑ Carnoy, David (2010-10-20). "Will Amazon produce a Kindle phone?". C|Net. CBS Interactive Inc. Retrieved 2014-06-19. 1 2 3 Carr, Austin (2015-01-06). "The Real Story Behind Jeff Bezos's Fire Phone Debacle And What It Means For Amazon's Future". Fast Company & Inc. Mansueto Ventures, LLC. Retrieved 2015-01-06. ↑ Brandom, Russell (2015-01-06). "Jeff Bezos reportedly approved 'even the very smallest decisions' on the Fire Phone". The Verge. Vox Media. Retrieved 2015-01-06. ↑ Luk, Lorraine (2012-07-11). "Amazon, With Suppliers, Is Testing a Smartphone". The Wall Street Journal. Dow Jones & Company, Inc. Retrieved 2014-06-19. ↑ Culpan, Tim; Kharif, Olga; Vance, Ashlee (2012-07-06). "Amazon Said to Plan Smartphone to Vie With Apple IPhone". Bloomberg. Bloomberg L.P. Retrieved 2014-06-19. ↑ Chuang, Steve (2012-12-14). "Foxconn Allegedly Manufacturing Amazon's Smartphone Model". China Economic News Service. Retrieved 2014-06-19. ↑ Patel, Nilay (2012-05-12). "Exclusive: Amazon phone confirmed, could be announced tomorrow". The Verge. Vox Media. Retrieved 2014-06-19. ↑ Willis, Adam (2014-05-26). 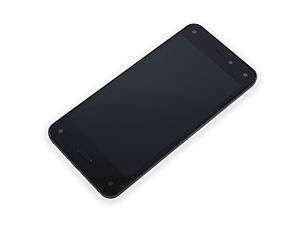 "Amazon Smartphone – Rumored Specs". Gamer Headlines. The Gamer Headlines. Retrieved 2014-06-18. ↑ Erati, Amir; Lessin, Jessica (2013-09-06). "Exclusive: Amazon Wants To Offer Its Smartphone for Free. Who Will Follow?". The Information. Retrieved 2014-06-18. ↑ Efrati, Amir (2013-09-08). "Amazon: No Phone Launch 'This Year' and 'Would Not Be Free'". The Information. Retrieved 2014-06-19. ↑ Bensinger, Greg (2013-05-09). "Amazon Is Developing Smartphone With 3-D Screen". The Wall Street Journal. Dow Jones & Company, Inc. Retrieved 2014-06-19. ↑ Bensinger, Greg; Rusli, Evelyn M. (2014-04-11). "Amazon Preparing to Release Smartphone". The Wall Street Journal. Dow Jones & Company, Inc. Retrieved 2014-06-19. ↑ Peterson, Andrea (2014-06-18). "Everything we think we know about Amazon's rumored smartphone". The Washington Post. Retrieved 2014-06-18. 1 2 "Personalize your Fire Phone". Amazon.com. 2014-06-18. Retrieved 2014-06-18. 1 2 "Fire Phone: Amazon Apps and Tools". Amazon.com. 2014-06-18. Retrieved 2014-06-18. ↑ Top Mobile Trends (4 June 2016). "Amazon 3D Fire Phone – Amazon's new phone comes with a 3D display". Top Mobile Trends. Retrieved 11 August 2016. ↑ Warren, Christina (2014-09-08). "Fire Sale: Amazon Cuts Price of Fire Phone to 99 Cents". Mashable. Retrieved 2014-09-08. 1 2 "Amazon's smartphone unveil". arstechnica. Condé Nast. 2014-06-18. Retrieved 2014-06-18. 1 2 Bohn, Dieter (2014-06-18). "Amazon's Fire Phone: hands-on with the ultimate buying machine | The Verge". The Verge. Vox Media. Retrieved 2014-06-18. 1 2 "Fire Phone: Technical Details". Amazon.com. 2014-06-18. Retrieved 2014-06-18. ↑ Hesseldahl, Arik (2014-07-28). "Amazon Fire Phone Costs $205 To Build, Teardown Shows". Re/code. Revere Digital LLC. Retrieved 2014-07-29. 1 2 3 Rose, Brent (2014-06-18). "Amazon Fire Phone Hands-On: Great For Amazon, Less For You". Gizmodo. Gawker Media. Retrieved 2014-06-18. 1 2 "Amazon Press Conference: Jeff Bezos introduces Fire phone, the first smartphone designed by Amazon". YouTube. Google. 2014-06-18. Retrieved 2014-06-19. ↑ Limer, Eric (2014-07-25). "The Amazon Fire Phone's Headphones Are What All Cheap Earbuds Should Be". Gizmodo. Gawker Media Group. Retrieved 2014-08-19. 1 2 3 el Akkad, Omar (2014-06-18). "Amazon Fire Phone to lure buyers into its shopping world". The Globe and Mail. Thomson Reuters Ltd. Retrieved 2014-06-18. ↑ Siegal, Jacob (2014-08-19). "Latest update makes Amazon's Fire phone slightly more usable than before". BGR. BGR Media, LLC. Retrieved 2014-08-19. ↑ "Fire Phone: Dynamic Perspective". Amazon.com. 2014-06-18. Retrieved 2014-06-18. 1 2 3 4 5 6 "The 10 coolest things about Amazon's new Fire Phone". The Verge. Vox Media. 2014-06-18. Retrieved 2014-06-18. ↑ "Fire Phone: Mayday". Amazon.com. 2014-06-18. Retrieved 2014-06-18. ↑ "Fire Phone: Firefly". Amazon.com. 2014-06-18. Retrieved 2014-06-18. ↑ Nguyen, Chuong H (2014-12-17). "Fire Phone update focuses on camera, calling and messaging features". Android Central. Mobile Nations. Retrieved 2014-12-21. 1 2 Molen, Brad (2014-06-18). "Amazon's Fire phone has average looks and high aspirations (hands-on)". Engadget. AOL, Inc. Retrieved 2014-06-18. ↑ Russell, Kyle; Lardinois, Frederic (2014-06-18). "Hands-On With The Amazon Fire Phone". TechCrunch. AOL Tech. Retrieved 2014-06-18. ↑ Kastrenakes, Jacob (2014-06-18). "Amazon's Fire Phone doesn't include Bluetooth LE, and that's bad news for wearables". The Verge. Vox Media. Retrieved 2014-06-18. 1 2 3 4 Baptiste, Jean (2014-06-19). "4 Reasons The Amazon Fire Phone Will Fail". Forbes. Forbes.com, LLC. Retrieved 2014-06-19. ↑ Milian, Mark (2014-06-18). "Amazon's Fire Won't Set the World Ablaze Just Yet". Bloomberg. Bloomberg L.P. Retrieved 2014-06-19. ↑ Miller, Matthew (2014-06-18). "Amazon Fire smartphone: Will hardware, service plan pricing keep customers away?". ZDNet. CBS Interactive. Retrieved 2014-06-18. ↑ Prospero, Michael (2014-06-18). "Amazon Fire Phone Hands-On: A Spark of Innovation". LaptopMag. techmedia NETWORK. Retrieved 2014-06-18. ↑ Molen, Brad (2014-07-22). "Amazon Fire phone review: a unique device, but you're better off waiting for the sequel". Engadget. AOL Inc. Retrieved 2014-07-23. ↑ Mossberg, Walt (2014-07-22). "Can the Amazon Fire Phone Take on iPhone and Samsung?". Re/code. Revere Digital LLC. Retrieved 2014-07-29. ↑ Amazon Fire Phone Review. Retrieved 23 July 2014. ↑ Manjoo, Farhad (2014-07-22). "Amazon's Fire Phone: Solid Device Beneath a Layer of Whiz-Bang Frippery". The New York Times. The New York Times Company. Retrieved 2014-07-23. ↑ Fowler, Geoffrey (2014-07-23). "Amazon Fire Phone Review: Full of Gimmicks, Lacking Basics". The Wall Street Journal. Dow Jones & Company, Inc. Retrieved 2014-07-23. ↑ Whittaker, Zachary (2014-07-28). "Hands-on with Amazon's Fire Phone: Gimmicks over purpose". ZDNet. CBS Interactive. Retrieved 2014-07-29. ↑ "The Amazon Fire Is the Most-Polluting Smartphone". Motherboard. ↑ Meadows, Chris (2014-10-03). "Greenpeace deluges Amazon Fire Phone with one-star protest reviews". TeleRead. Gadgetell LLC & North American Publishing Company (NAPCO). Retrieved 2014-10-26. ↑ Pomerantz, David. "HELP flood Amazon.com with 1-star reviews for their first ever smartphone, the Amazon Fire.". Greenpeace. Greenpeace. Retrieved 2014-10-26. ↑ Brownlee, Marques (2014-12-07). "Smartphone Awards: 2014!". YouTube. Retrieved 2014-12-21. ↑ D'Onfro, Jillian (2014-12-02). "Jeff Bezos: Why It Won't Matter If The Fire Phone Flops". Business Insider. Retrieved 2015-01-06. ↑ Duryee, Tricia (2014-06-30). "Amazon Fire Phone nosedives on company's bestsellers list, dropping to #61 after debuting in top five". GeekWire. GEEKWIRE, LLC. Retrieved 2014-07-29. ↑ Rushe, Dominic (2014-07-24). "Amazon posts huge loss in second quarter, despite sales rise". The Guardian. Guardian News and Media Limited. Retrieved 2014-07-29. ↑ D'Onfro, Jillian; Weissman, Cale (2014-07-25). "We Visited A Bunch Of AT&T Stores And Found Almost No One Who Cared About Amazon's New Phone". Business Insider. Business Insider Inc. Retrieved 2014-07-29. ↑ "Amazon Fire Phone Shows Steady, but Slow Growth in North America". Chitika Insights. Chitika, Inc. 2014-08-19. Retrieved 2014-08-19. ↑ Arthur, Charles (2014-08-26). "Amazon has sold no more than 35,000 Fire phones, data suggests". The Guardian. Guardian News and Media Ltd. Retrieved 2014-08-26. ↑ Manjoo, Farhad (13 September 2014). "Smartphones: The Corporate Personality Test". The New York Times. Retrieved 13 September 2014. ↑ Whitwam, Ryan (2014-10-24). "Amazon has $83 million worth of Fire Phones it can't sell". Geek.com. Ziff Davis, LLC. Retrieved 2014-10-26. ↑ "Amazon exec: We priced the Fire Phone wrong". Fortune. October 30, 2014.